He promptly sat down at the dinner table and began composing his opus. It was the story of a “tan skinned” pirate of Somali origin who hijacks a boat with an AK-47. In broken English, the pirate threatens all the passengers on the ship with his weapon. Then they die. When my son showed me his essay afterwards, I was mortified. “You can’t write this!” I exclaimed. “You sound like a racist!” I then forced him to expurgate the most offensive passages from his text, including the color of the pirate’s skin and the derogatory description of his accent. 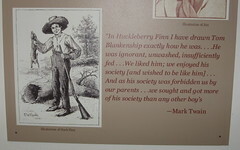 Image: Huck Finn by CaZaTo Ma via Flickr under a Creative Commons license.